Touch ‘n Foam Professional Foam Sealant is a high performance, moisture curing, expanding polyurethane foam sealant. Foam Sealant provides a permanent seal against air, moisture and insect infiltration while improving comfort and reducing energy usage. 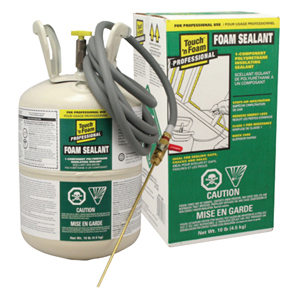 Use Foam Sealant to seal around plumbing, ventilation outlets, electrical junctions, between sill plates and concrete slabs, or anywhere you need a fast, economical air-sealing moisture barrier. Formulation is tack-free in 30 minutes and fully cured in 4 hours.